Distance from the Liberty Stadium: 173 miles ~ 3.5 hours. The stadium is high on a hill with no buildings close, so looks impressive from a distance, especially at night. The home fans can make a big noise, so the atmosphere should be pretty good. Up to 2,800 Swans fans can be housed in the south stand at one end of the ground. Excellent facilities are available in the ground with good views of the pitch as well as beer, lager and cider sold in the bars. Be wary of wearing club colours around the ground and in the pubs. There is quite a bit to do in the Stoke-on-Trent area, from learning about its famous pottery heritage to visiting the air museum at RAF Cosford, some 24 miles away. If you’re planning on making a weekend of it, the ‘North Stafford Hotel’ (ST4 2AE) is right outside the train station, with ‘The Plough Motel (ST4 4EN), Kenwood Guest House (ST4 2DP), ‘Wheatsheaf Hotel’ (ST1 4LW), ‘Victoria on the Square (ST1 4JH) and ‘Quality Hotel (ST15NB) not far away. Alton Towers (ST10 4DB) and Monkey Forest (ST4 8AY) are closed for the winter. The night before the game, The Darkness are at Victoria Hall (ST1 3AD) tickets are £31.65. Rob Brydon is there on the Sunday, tickets are £29.15. Potteries Museum and Art Gallery (ST1 3DW) and Shire Hall Gallery (ST16 2LD) have various exhibitions. There aren’t many away fans friendly pubs near the stadium except for Holiday Inn and a Harvester next to the stadium. You can park at the Harvester for £10 but it can take ages to get out after the game. On the canal located behind the main stand are two barges, one selling traditional locally made oatcakes, the other sells beer; both are very popular. Close to the stadium (0.2 miles) is a Power League complex (ST4 4TN) has a bar with Sky TV and allows in away fans, parking is £5. ‘Longton Rugby Club’ (ST4 8WG) is a mile away and a 20 minute walk with parking at £5. Near the train station is ‘Terrace Bar’ (ST4 2BW) and 2.5 miles away. The shuttle bus to the stadium stops outside the pub and (£3 return trip), stopping at the pub after the game. An option is to stop en-route in the village of Stone which is 9 miles south of the stadium and off junction 14 of the M6. It has quite a few pubs that serve food, among them ‘The Royal Exchange’ (ST15 8DA), ‘Langtrys’ (ST15 8EB) – also has accommodation, ‘The Poste of Stone’, a Wetherspoons (ST15 8AB), ‘The Red Lion Inn (ST15 8AJ) and the ‘Star Inn’ (ST15 8QW). ‘The Crown & Anchor’ (ST15 8JP) is more of a restaurant now than a pub. Not much parking is near the ground and need to book to use the official car park; a nightmare to get out of. There’s parking (around £5) at the industrial units on Great Fenton Business Park (ST4 4LZ), a signposted 10 minute walk from the ground. To the north of the stadium, there’s street parking on Grove Road (ST4 3AY). It’s a 15 minute walk to the stadium along a footpath. 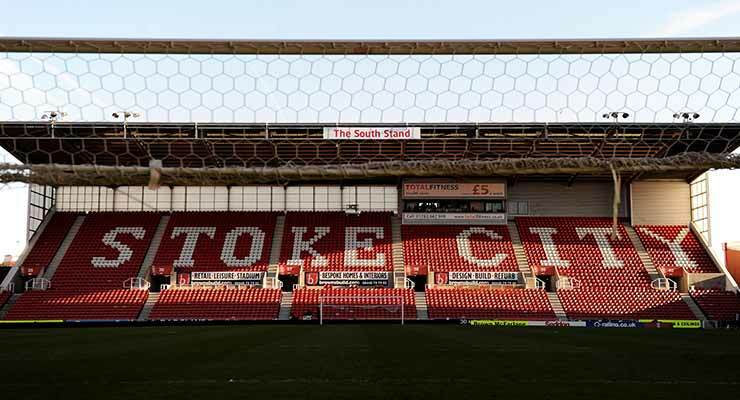 You can also choose from a selection of private car parking spaces near the bet365 or Britannia Stadium – including on-street parking, off-street car parks and around 8 reservable parking spaces from just £4.00 per day. Stoke railway station is a two mile hike or £7 by taxi. Buses are £3 return, £2 for concessions from Glebe Street to the stadium. It’s a 5 minute walk from the station; turn right, head down Station Road. At the bottom of Station Road at the traffic lights, turn right to go along Leek Road. Then across the A500 dual carriageway and into Glebe Street which is straight across in front of you. You should then see the line of buses that will take you to the stadium. Stoke is a 4 hour train ride from Swansea on the 11:55, 12:29 and 12:54. There are no trains back to Swansea after the game.